Italy is a country where everyday wine is less expensive than Coca-Cola or milk, and where nearly every family owns some vineyards or has some relatives who supply most of their daily needs - which are not great. Even though they live in one of the world's largest wine-growing countries, Italians drink relatively little, and usually only at meals. If Italy has an infinite variety of regional dishes, there is an equally bewildering array of regional wines, many of which are rarely exported because they are best drunk young. Even wines that are well known and often-derided clichés abroad, like Chianti or Lambrusco, can be wonderful new experiences when tasted on their home turf. Unless you're dining at a restaurant with an exceptional cellar, do as the Italians do and order a carafe of the local wine (vino locale or vino della casa). You will not often be wrong. 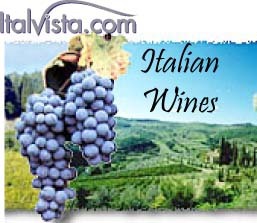 Most Italian wines are named after the grape and the district they come from. If the label says DOC (Denominazione di Origine Controllata e Garantita) is allegedly a more rigorous classification, indicating that the wines not only conform to DOC standards, but are tested by government appointed inspectors. At present few wines have been granted this status, but the number is planned to increase steadily. Classico means that a wine comes from the oldest part of the zone of production, though it is not necessarily better than a non-Classico. Riserva, superiore or speciale denotes a wine that has been aged longer and is more alcoholic. The regions of Piedmont, Tuscany, and Veneto produce Italy's most prestigious red wines, while Friuli-Venezia Giulia and Trentino-Alto Adige are the greatest regions for white wines. King of the Tuscans is the mighty Brunello di Montalcino (DOCG), an expensive blockbuster. Pinot Grigio and the unusual Tocai make some of the best whites. But almost every other corner of Italy has its vinous virtues, be it the Lambrusco of Emilia-Romagna, the Orvieto of Umbria, the Taurasi of Campania or the Frascati of Lazio. The well known Valpolicella, Bardolino and Soave are produced on the shores of Lake Garda. Even in the south, with much of its stronger, rougher wine shipped north for blending, you will find some wonderful varieties, such as the Sicilian Corvo (red and white). Other Italian wine words are spumante (sparkling), frizzante (petillant), amabile (semi-sweet), abboccato (medium dry), passito (strong sweet wine made from raisins). Rosso is red, bianco white; between the two extremes lie rubiato (ruby), rosato, chiaretto or cerasuolo (rose). Secco is dry, dolce sweet, liquoroso fortified and sweet. 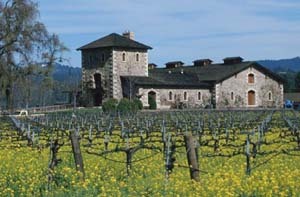 Vendemmia means vintage, a cantina is a cellar, and an enoteca is a wine-shop or museum where you can taste and buy wines. Italy turns its grape harvest to other uses too; producing Sicilian Marsala, a famous fortified wine fermented in wooden casks, ranging from very dry to flavored and sweet and vin Santo, a sweet Tuscan specialty often served with almond biscuits. 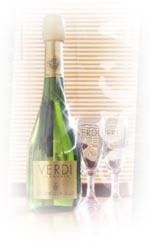 Vermouth is an idea from Turin made of wine flavored with Alpine herbs and spices. Italians are fond of brandies (to aid digestion) - Stock or Vecchia Romagna appear on the best-known Italian brandy bottle. 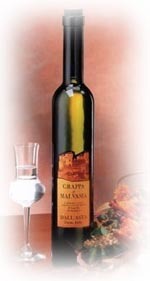 Grappa is a rough, schnapps like spirit used in black coffee after a meal (a caffe corretto). Other drinks you'll see in any Italian bar include Campari, a red bitter drink on its own or in cocktails; Fernet Branca, Cynar and Averno (popular aperitif/digestifs); and a host of liqueurs like Strega, the witch potion from Benevento, apricot-flavored Amaretto, cherry Maraschino, Sambuca or limoncello. Taste characteristics of pasta and rice depend on the kind of sauce you use: meat based sauces prefer red wines but fish based ones match better with white wines. 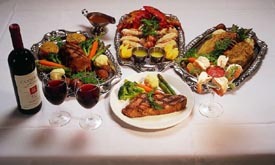 Meat is a quite versatile food that can match both with whites and with reds: generally red meats require red wines but white ones can match with white (and full bodied) wines too. Every kind of cheese prefers a particular kind of wine; normally cheeses with soft paste prefers light wines and cheeses with aged and hard paste need red and full bodied wines. Cakes, cookies and all kind of dessert need sweet wines. Generally it is not a good idea to drink wine with chocolates, artichokes and above all if you use vinegar. 2002 ® Powered by CRT, Web Design, Hosting, Maintenance.